The all-new Content Marketplace is a dedicated platform for TV and film content creators, production houses and studios, distributors of content, producers, editors and advertising houses to buy, sell and explore co-production opportunities for the Arabic market. More than 500 local, regional and international content buyers will acquire, programme and commission new and existing content from scores of free-to-air, digital and Pay TV channels and networks, broadcasters and sportscasters, telcos, satellite companies and video content platforms. 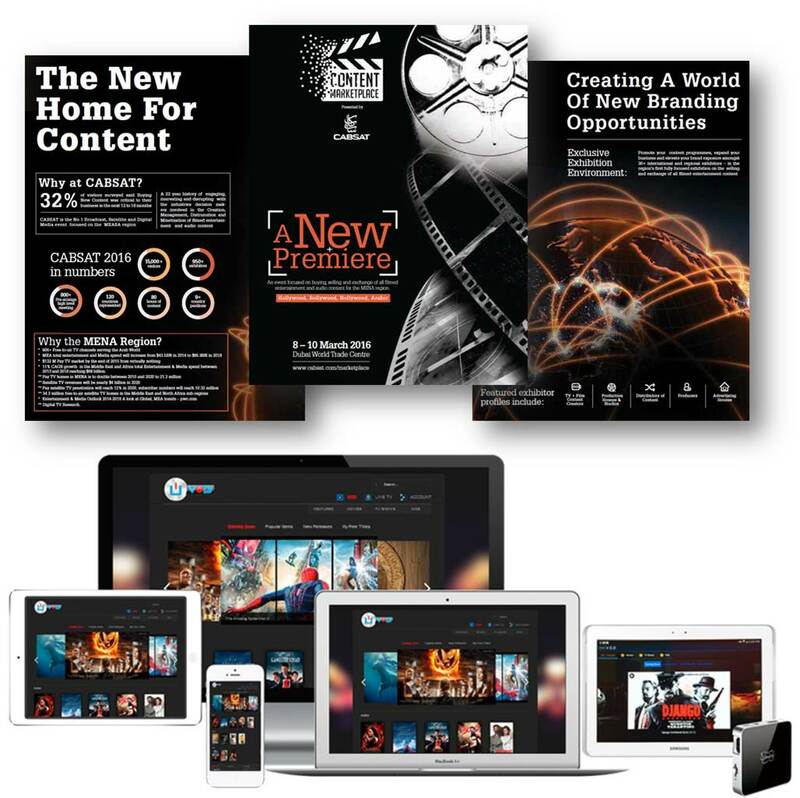 With more than 950 local, regional and international companies participating in the core CABSAT 2016 exhibition, the new Content Marketplace feature is a direct response to 32 per cent of last year’s show visitors claiming new content was ‘critical’ to their business in the next 12 to 18 months. The previews will be maintained on a daily basis and the link CABSAT2016 will always show the growing number of featured companies in alphabetical order. WPSD, an NBC affiliate station based in Paducah, Kentucky, has expanded its field newsgathering capabilities with the AVIWEST DMNG PRO 180 3G/4G bonded cellular video transmission system. An ultra-compact and highly portable camera-mounted device, the DMNG PRO enables WPSD news teams to transmit live, high-quality video from the source of breaking news and other live events without having to deploy bulky and costly microwave equipment. In addition, WPSD has deployed the AVIWEST DMNG APP iOS to the news team, enabling team members to use their iOS®-based smartphones to transmit video content instantly from the phone's front or rear camera. Bonne Pioche, a leading French television and film production company, has selected the DMNG PRO180-RA video uplink system to deliver live broadcast transmissions of "J'irai dormir chez vous - le direct" ("I'm Sleeping Over Tonight - Live"). The popular television show, broadcasted live by the public television network France 5, follows French backpacker, TV host, and producer Antoine de Maximy as he travels the world and meets new people. In the show, de Maximy carries two body-worn cameras and two DMNG PRO180-RA video uplink systems in a specially designed backpack from AVIWEST. A third camera, a video uplink system, and a second backpack are used by an additional cameraman. Gearhouse Broadcast Gulf has launched a privately owned multi-functional outside broadcast production vehicle with DSNG capabilities. The Iveco 70C17 is fully 3G and HD compatible and runs six main Hitachi SK-HD1300E cameras with two optional Vislink RF cameras, and will be available to rent throughout the Middle East. Built by Hitachi Kokusai Electric Turkey, the vehicle is being debuted on its stand at CABSAT2016 (ZA1-30) between 8-10 March in Dubai. deal for use both as a small, flexible production vehicle and in the field newsgathering, Gearhouse’s new van excels on productions where a larger OB truck would be impractical or cost prohibitive. QVC, the world’s leading video and e-commerce retailer, has significantly increased its current camera control capabilities with the installation of a complete 32-camera control system driven by a large number of TR-QP panels and TR-XT control systems in its US broadcast facility. The system provides for all cameras to be directly controlled from each compact TR-QP via joystick or a number of key camera functions enabling QVC to change studio configurations rapidly, a key requirement in the demanding live TV production environment. This installation continues the global technical relationship between the two companies that began in 2008 at QVC’s UK broadcast centre and has since grown to every QVC location in the world. “Restaurant Is Looking for a Chef” (Gostilna išče šefa) is a popular Slovenian reality TV show produced by broadcaster Pro Plus, shot both on location at a restaurant in Ljubljana, and with a substantial studio section recorded in Pro Plus’s main facility in Ljubljana. Lighting designer Ziga Krajnc looked after the studio aspects of the most recent series for which he specified eight of Robe’s LEDWash 800s, LEDBeam 100s, MMX Spots and PARFect 100s. These were a combination of new fixtures purchased by the studio this summer and rental items from locally based Event Lighting. Ziga, also works full time for Event Lighting, a frequent supplier of extra moving lights and specials as needed for selected Pro Plus shows. Echoing throughout the first day were the sentiments of the IABM’s Annual Conference in December, that the industry needs greater collaboration between suppliers and broadcasters to roadmap a technology and business plan for the future of the business. At the forefront of this was the need for assistance from suppliers when broadcasters are investing large sums of money in new or refurbished facilities. Most broadcasters are facing a dilemma when it comes to re-equipping new buildings to take their businesses forward for the next five to ten years. What technology investments need to be made, what workflow dynamics need to be accounted for and what cost-savings can be forecasted to fit within a decreasing budget? "FIS World Cup events are complex productions that demand extensive and versatile communications," said Kathrin Hager, general manager and head of marketing and sponsoring at Ski World Cup Adelboden. "Riedel Switzerland helped us to design a network that tied together thousands of essential communications threads and to ensure that all key user groups were connected in a way that supported their roles in making the race a success." Riedel Switzerland engineers worked closely with race directors in designing the radio network infrastructure that served as the event's communications lifeline. On December 8, 2015 the German TV viewers who didn’t switch channels during the commercial break were rewarded with a special commercial: at prime time, precisely at 8.13 p.m., the Telekom switched to Coldplay’s Street Gig in Offenbach, Germany, on eight of the highest-rated German private broadcasters – in time for the performance of their new single “Adventure Of A Lifetime”. Additionally to the on site concert experience at the Capitol in Offenbach and to the numerous live commercials on television, the concert could also be followed via the live stream on YouTube, Facebook and Twitter – for free! The broadcast of the German premiere of the new album “A Head Full Of Dreams” and the only Coldplay concert in Germany in 2015 was carried out by the production company Neoxfilm on behalf of 2Bild GmbH in cooperation with the technical service provider TV SKYLINE. Robe’s new Square LED fixture made its European live TV debut on the three shows produced by Flanders’ public broadcaster VRT which selected the song to represent Belgium at the 2016 Eurovision Song Contest (ESC) in Stockholm. The shows featured an intricate and interesting lighting design by Ignace D’Haese from Arf & Yes. The 24 active Square fixtures were central to Ignace’s scheme and concept for the shows which were staged at AED Studios in Lint, Belgium, in front of a live audience and a huge TV following who tuned in to watched the five final contestants perform their songs … before voting on the winner. Six years after Martin Audio’s ground-breaking MLA system made its world debut with veteran Hamburg hip hop band Fettes Brot, the system’s first adopter — Complete Audio’s André Rauhut — has just completed another successful tour of duty, this time supporting the band’s Teenager vom Mars tour. Although the tour originally kicked off early in 2015 using largely local PA, the production values were ramped up towards the end of the year when Fettes Brot played venues ranging from around 3,500 to 15,000. The Berlin-based production company based its rig design around a core of between 7 and 10 MLA cells per side, plus MLD Downfill — and depending on venue size, they also carried 12 x MLA Compacts for outfills in the larger venues. Along the front of the stage, 14 MLX were set up as a broadside cardioid array. BroaMan has announced a new version of its Route66 video router, now offering AutoRouter and smart fibre patch bay. This additional functionality is powered by sister brand Optocore, making it ideal not only for Installation (where there are multiple connection points, including mobile devices) but equally for Live Events or Broadcast. The AutoRouter is compatible with Optocore and DiGiCo fibre loops, creating a redundant ‘star’ out of the advanced ring topology. It was developed based on customer’s needs, especially in the installation market, where mixed ring/star or star topology is more desirable due to a star based fibre cable layout. Suitcase TV Ltd, leaders in the transition from traditional broadcast to IP, has announced record visitors to its stand at BVE 2016 in London, where the company held twice the number of meetings as the previous year. The company focused on MediaStor, a well-established product that offers enhance storage and archiving capabilities, and iphrame Vision, an IP-based vision mixer offering media companies the ability to stream live content over IP, SDI, or a combination of both. The products have generated a great deal of interest and have been mentioned in several important industry publications including BVE Daily, which published two separate news items about Suitcase TV and its solutions. On 2nd of March 2016, Salzbrenner Stagetec Audio Video Mediensysteme, the Mediagroup’s Systems Integrator, hosted its very successful HighTecDay for the third time. The unique concept was once again a positive experience for the delegates. Short in-depth presentations of hot topics related to the latest technologies and products were combined with intensive hands-on opportunities and technical discussions with experts on the product islands. The case studies, presented by highly regarded theatre and opera specialists, were well attended by the international audience. For the first time, the programme was expanded with an additional workshop and an open discussion allowing deeper exploration of individual subjects. As a leading provider of technical, production and distribution services, the MEDIAPRO Group knows what it takes to produce a great live production. Having been a customer of EVS for over 20 years, it understands the importance of using the right equipment in the unforgiving live environment. El Clásico is a clash between Spain’s two biggest clubs Real Madrid CF and FC Barcelona, and one of the biggest and most prestigious matches in world football. The first El Clásico of the 2015/2016 La Liga season was played in Madrid in November. In charge of producing the host broadcast feed for the game, MEDIAPRO wanted to broadcast feeds in both HD and Ultra-HD. To do this, it installed a number of EVS technologies to enable the production. Some of the Rio 2016 Olympic Games will be covered in 8K ‘Super Hi-Vision’ (for Japan), and there will be 4K Ultra HD versions created for testing and comparison purposes. The 8K versions for Japan will include ‘immersive’ audio using what Olympic Broadcasting Services (OBS) describe as “3D 22.2 channel audio surround sound”. Some 130 hours (out of a claimed 7,000 hours of actual TV coverage) of 8K Super Hi-Vision will be beamed from Brazil to Japan, including live coverage of the opening and closing ceremonies, as well as Swimming, Judo, Athletics, Basketball and Football. In addition, an ENG camera crew will capture select sports at other venues, “including the Olympic spirit and atmosphere” for re-play later. National Theatre Live will partner with the Royal Court and Playful Productions to broadcast Hangmen from London’s West End. It will be captured in ultra-detailed Sony 4K and projected in the highest picture quality to audiences across Vue Cinemas’ 84-site estate. The production marks the fourth collaboration in the year-long partnership between National Theatre Live, Vue Entertainment and Sony Digital Cinema 4K, which has already seen 4K productions of Behind the Beautiful Forevers, The Beaux Strategem and Hamlet hit the big screen from the stage. The work continues to garner the attention of cinema goers, with world-class theatrical experiences arriving on the big screen in unsurpassed 4K clarity.